Motorists in Leicester have had a narrow escape after the canopy of a car garage collapsed, landing on two cars in the forecourt. The incident took place at a BP petrol station and adjoining car garage in Ashby Road, Coalville on 19 July, The Leicester Mercury reported. 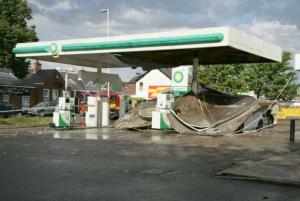 Heavy rain caused the roof above the petrol pumps to collapse on top of two vehicles, although no drivers were inside them at the time. Accidents like this highlight the importance of a multi-faceted combined motor trade insurance policy. While the damage caused to the premises by the sudden storm will need to be covered through the building insurance, the company would also need cover for the damage caused to the customer’s vehicle parked on site. Furthermore, although thankfully no one was hurt in this instance, public liability cover is essential for any public-facing business so that both customers and the business are protected should they suffer from an accident at the premises. A spokeswoman for Leicestershire Fire and Rescue Service, who were called to scene, said: “The internal structure of a forecourt canopy collapsed onto two cars at a petrol station. There were no persons trapped in the cars or injured. There was no-one in the vehicles when it happened. A further five incidents of damage caused by the heavy rain were reported in the area on the same day.